Since people really appreciated our tips on how to get to JFK airport, I thought I should also share some of my thoughts on the options for traveling between Manhattan and Newark Airport (EWR). Sometimes the best flight options involve travel from EWR. However, getting to EWR is more difficult and more expensive than going to JFK, so you should take that into consideration when selecting your flight. While Newark Liberty Airport is less than 20 miles from midtown Manhattan, traffic across the Hudson River regardless of what crossing you use can be a bit unpredictable, so always leave extra time. 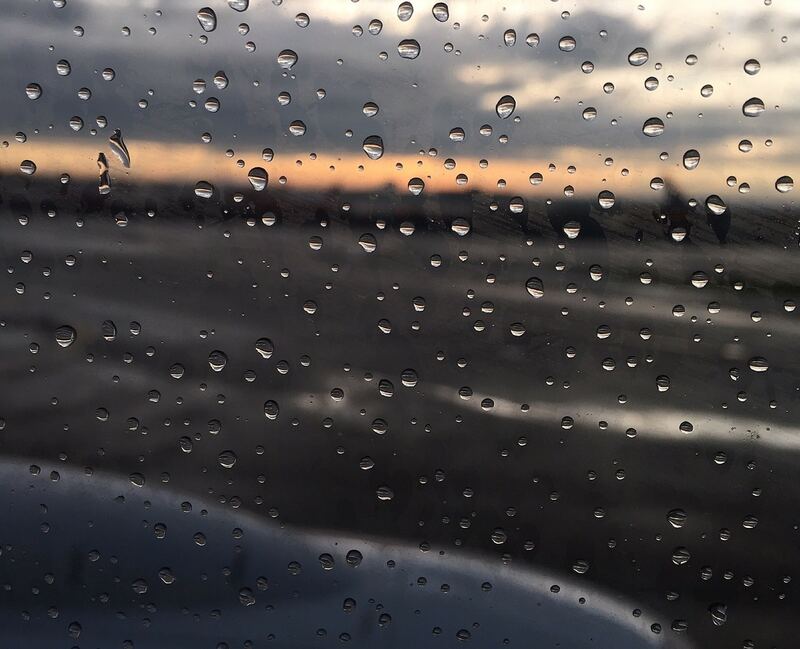 A rainy sunset as seen from a plane at Newark Airport. Do you have a lot of bags? What terminal are you going to? 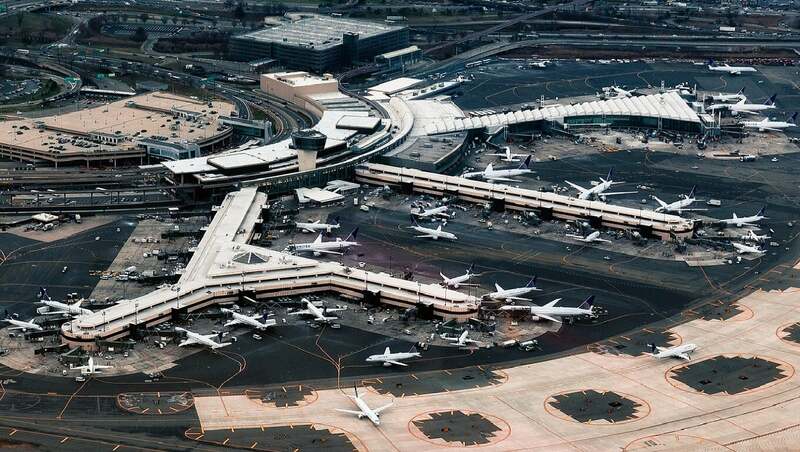 Will you be traveling to EWR during rush hour (7-9 am or 4-7pm)? In this post, I will share the pros and cons of each Newark airport transportation option. This information applies whether you need transportation from Manhattan to Newark Airport or want to travel from Newark to Manhattan. If you are traveling to LaGuardia Airport, check out my post on going from LGA to Manhattan. You can take New Jersey Transit trains from Penn Station to the Newark Airport Rail Station, which takes less than 30 minutes. Then you will need to take the Air Train to your terminal. The ticket for the AirTrain is included in the price of your train ticket, but you need to use the NJ Transit train ticket to board the Air Train. Make sure you buy your ticket before you board the train or you will have to pay a penalty fare. You can buy the tickets at the machines at the station or through the New Jersey Transit mobile app. At Penn Station, there is also a ticket window. Inside Penn Station you can catch a NJ Transit Train to Newark Airport Rail Station. Please get to Penn Station early enough to allow for extra time if you need to purchase a ticket (lines can be long) and figure out what platform the train will be on. Some trains will also stop at Newark Penn Station – do NOT get off there, it is not the airport stop. Check the departure board and make sure your train has an airplane symbol or “EWR”. Going on the train with luggage can be difficult especially during peak hours. Luckily there are escalators so you don’t have to worry about carrying luggage up or down stairs. Although there have been times when they have been out of service. Also, I have to warn you about the reliability of the AirTrain. I have probably taken it 10 times and have had problems twice. Maybe I am just unlucky? Well, both times I was really thankful I had time to spare. Check the schedule for the NJ Transit Trains to EWR here. Cost: From Penn Station, it is $13 each way. This is the cheapest way to go between Manhattan and Newark Airport. The Newark Airport Express bus can be a good option to get to EWR, especially if you are close to one of the stops and have a lot of bags. 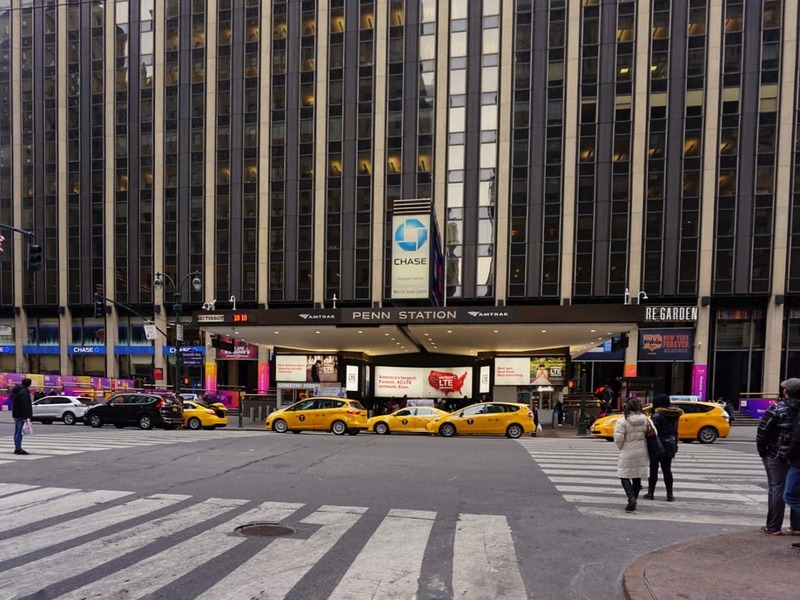 I pick up the bus at Bryant Park (42nd St. between 5th and 6th Avenues) but there are also stops by Grand Central and the Port Authority Bus Terminal. Newark Airport Express is cheaper than a car, and you can buy tickets on the bus. 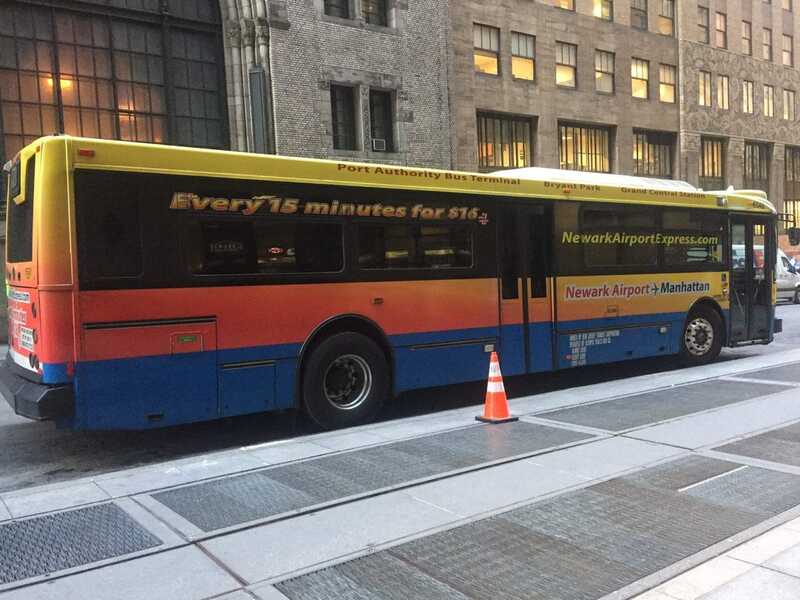 However, the Newark Liberty Airport Express bus only runs every 20-30 minutes and can be delayed if there is traffic. I would recommend getting to the bus stop 2 hours before you need to be at the airport to allow for delays and traffic. The bus to Newark Airport does have free WIFI, although it has never worked that well for me. The bus is a great option to get to Newark, but they don’t always stay on schedule. Note: Beginning on August 1, 2017, a downtown route for the Newark Airport Express was added. Now there are buses that run direct from Freeman Plaza West (Hudson St. between Canal St. and Broome St) to Newark airport every 30 minutes. The hours it runs is limited though, so please check the Newark Airport Express website for more details. I think this could be a great option if you are trying to go from lower Manhattan to Newark Airport during peak hours. Go Airlink NYC offers a shuttle service which picks you up at your door and takes you directly to Newark Airport. Most likely you will also be making stops to pick up other passengers, so it is not going to be the fastest option. The EWR airport shuttle could make things a lot easier if you have a lot of luggage, so the extra time might be worth it. Taking the shuttle to Newark Airport makes the most sense if you are traveling alone as they charge per person. You can make a reservation for the Newark Airport Shuttle online here . Cost: Prices for the Newark Airport Shuttle start at $17 per person each way. I have found this to be cheaper than other similar options. Of course, you can just get a taxi to Newark Airport from NYC if you are in a pinch, but I would not recommend it. It will cost you whatever the meter reads plus tolls ($10.50 – $15.00) and the Newark surcharge ($17.50). Additionally, I would say getting a taxi from Newark to Manhattan should be your last resort. Coming from EWR to the city you will have to use a Newark Taxi instead of an NYC one. 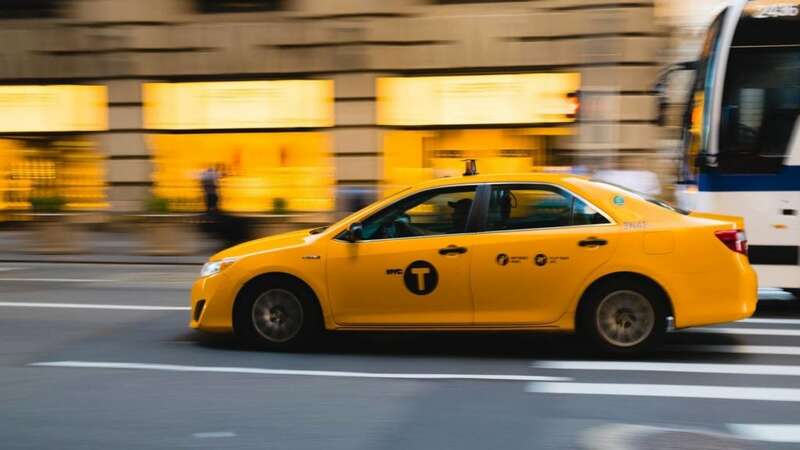 Newark Airport to Manhattan taxi fares range $50 to $70 but also be prepared for lots of extra fees like surcharges for using a credit card ($5.50), traveling during rush hour ($5), and for bags over 24 inches. The taxi from EWR to Manhattan will also charge you for the toll ($10.50 – $15.00) and of course gratuity is not included. Taking a taxi may not be the best way to travel between NYC and Newark Airport. Cost: $65 – $105 depending on the time of day and where in Manhattan you are going. As long as it is not rush hour and there are no accidents, this will be the fastest way to get to or from the airport, but it can be pricey. You are paying to save time and not have to worry about carrying your bags around. It’s so nice to have a driver meet you at baggage claim when you land. Seeing my name on a sign, makes me feel important! A car service to Newark airport from Manhattan will vary a lot in price and many need advance booking. I think Carmel is best car service to Newark airport. They have special airport pricing which usually ends up being about the same as (or sometimes even less than) a taxi, but the cars are much nicer. Also, you can book online in advance and earn frequent flyer miles with most airlines for your trip to or from the airport. Carmel also has a handy app. Click here to check prices for Carmel Car Service online. I should mention you should never accept a ride from the drivers that come up to you at the airport and ask you if you need a taxi. This is against the law and many of these drivers may not be properly insured. Cost: Quotes for fares do not include tax, toll, or tip. The fare for taking a car to EWR can range from $40 – $150 depending on where exactly you are coming from, what type of car, and if you are able to get a discount. However, you can split the cost when traveling with others, there are no fees for additional passengers. Taking an Uber to Newark Airport is also an option, but pricing can vary greatly depending on the demand. A couple times, I have been lucky and have been able to get an Uber pool for $29 from Newark to my apartment in midtown. Both times this happened, I didn’t even have to share a ride from Newark airport to Manhattan with anyone. However, you cannot count on being able to get that price and I have not seen any Uber deals going to Newark Airport from Manhattan. If you haven’t signed up for uber yet, use this link and you can get $20 off your next ride! Cost: Quotes for fares do not include tip. The fare for taking for taking an Uber to EWR can range from $29 (Uber Pool) – $150 depending on where exactly you are coming from and the demand at the time you order the uber. However, you can split the cost when traveling with others, there are no fees for additional passengers. As you can see, there are several different options for transportation to Newark Airport. In summary, when I am traveling between Manhattan and Newark Airport for work, I like to take a car service or taxi, unless it is during rush hour. However, if I am trying to be frugal or it is rush hour, I will take the train to Newark Airport. If I have a lot of luggage and want to be frugal I would take the bus. If I have extra time and don’t want to deal with my luggage at all, I would take the Newark Airport Shuttle. Your priorities dictate the best option for traveling between Manhattan and EWR. The cheapest way to get to EWR is the train. The fastest way to get to EWR is a taxi/uber/car service as long as it is not rush hour. During rush hour the train is probably the fastest. If you have a lot of luggage, you should consider either a car, shared van or the bus. You may be able to get a great deal using Uber Pool from Newark Airport to Manhattan. Try to leave extra time to get to the airport whenever possible. You never know when there can be traffic or train delays and I don’t want you to miss your flight! Since I live on the East Side, I usually take the bus and then depending on the size of my bag, I will either take a taxi or the train home…but now there’s the Q train. Could be a game changer for me. During rush hour I would always opt for the train. And also note the train does stop running at 1 or 2 am, but the bus runs all night! Stephanie – Yes the Q train does really help. I usually take the bus as well but I have been really lucky with the uber pools coming home. Jessica – Oh wow a transatlantic cruise? Definitely let me know if you have any questions when planning your visit. I have been living here for over 12 years now. Good tips! I lived in NYC for years but always avoided flying into Newark if I could help it. Though, now that I think about it, LaGuardia is even worse! Allison – Thank you. Yes you know I saw on the news yesterday that the traffic getting to LaGuardia was so bad people were getting out of cars and walking through the snow! This certainly helps if you need to stopover in NYC and want to use different airports! Great post! Thanks, so glad you found it helpful. I finally made it to the The Weekly Postcard! Great tips! I do love all the how to get there and from there and all the in between tips from airports and just how to get around the city as well. Chasa so glad to have you back and glad you enjoyed the post. Ashlyn – Thanks so glad you found it helpful. That’s a really useful piece! Often people concentrate all on writing about the places they visit but not about the transport between them (which is often the hardest thing to arrange). Kiara – Thank you. Yes it can definitely be confusing, hope this post helps others. Thanks for this post, Anisa. I’m going to need these tips for my next trip to New York. I’m planning to go see some friends in Manhattan this spring and I was just thinking about the ordeal of getting to the airport. Last time I was there I took a cab, but I lost my plane because of the traffic. Anda – Happy to help. I also have a post about JFK in case you fly there. If I am around, we should try to grab a coffee. It would be great to meet you in person. Laura – Thank you. Yes that’s very true. I think it’s easier to use JFK but sometimes because of options or price, you need to use Newark. This is super helpful! In my case, I found that flights from Los Angeles to Newark were the cheapest. However, my sister told me not to arrive to that airport (so, I ended paying more). But, now, I know about taking the train to Penn Station (and then another train to my sister’s house). I feel like I can do that now that I am familiar with New York’s transportation. Ruth – Yes that is exactly why I wrote this post, so glad you found it helpful. We’ve tried train/subways to Manhattan from Newark and from JFK, and I definitely prefer the ride in from Newark. To me, it was much more straightforward and easier to navigate, and the price is pretty good. Thanks for sharing these other options! Laura – That’s interesting, I think most people in Manhattan prefer JFK. I hope these other options come in handy. Emese – So glad you found this helpful! I am sure you are going to have an amazing trip.